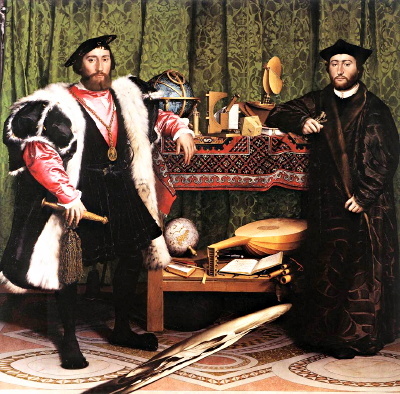 The neighboring picture by Hans Holbein is called “The Ambassadors” (1533, from Wikimedia Commons). Every thing is painted very realistic, in trompe-l’œil style. But what is the strange shape in the bottom foreground? You could try a slanting look on the image from top right. Easier: below I have cut out this shape; with the slider at the left you can change its angle, with the slider at the right its horizontal scale. This allows you to make the shape recognisable. A tip: memento mori. Holbein painted the shape with a strong perspective distortion, an example of an anamorphotic display. Now in the National Gallery in London, the painting originally hung at the bottom of a staircase, so descending that staircase the angle was just right.